NEED HELP WITH YOUR INTERNAL SOCIAL NETWORK? Launching and managing an internal social network like Yammer or Jive is not always easy. If you need a bit of help to get your network off the ground, download the first two chapters of my e-book for free. 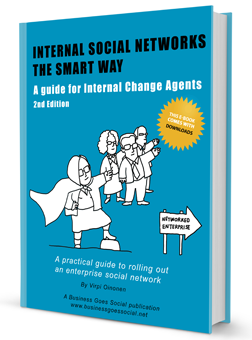 The book addresses the most common problems people face when trying to make an enterprise social network part of their organisation’s communication culture. Download the first two chapters now.